Use in furnaces: Duo-Therm, Hydro-Flame, Suburban works in “Park Model” furnaces which use a 24V AC ignitor board. 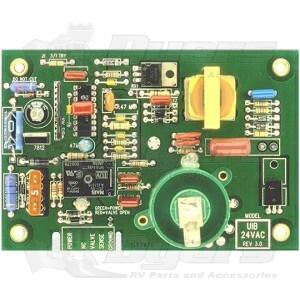 This board also has the same great features as the other Universal Ignitor Boards. Includes a fuse on the board to protect the board’s 24V circuits from short circuit damage and a green light to show power to the board and a red light to indicate power to the gas valve. For 24V AC furnaces only. Duo-Therm, Hydro-Flame, Suburban Furnaces and “Park Model” furnaces which use a 24V AC ignitor board. 3 try (Cut a jumper for single try).